The end is in sight. One more day after today! We know that by now, you may have had little "bumps in the road" while doing this detox -- and you've managed to come through them. Also, we've heard from many of you that during the "up" times of the detox, you've felt "spectacular." We also understand that some of you hit a bump that was a little too big and it stopped you, causing you to drop out. Don't worry about it. You can always try it again later. Just do a little more prep work first to make life easier. One thought to keep in mind: the more difficult your experience doing the detox, the more you need to do it. That means you should keep trying the liver detoxes until they become rather easy. At that point, you know your liver is pretty much cleaned out, and the detoxes then become mere holidays from food. Many of you may feel dehydrated. There are a couple of things that contribute to the sense of dehydration. First, the liver tea and tincture contain diuretic herbs that encourage you to urinate. This helps flush toxins from the body. They also contain herbs that help your kidneys. In addition, the psyllium, when taken at night, swells up and provides the bulk in your stools by absorbing a considerable amount of water. Between the herbs and the psyllium, your mouth may feel quite dry at times. Don't worry. Just keep drinking lots of fluids. For those of you who have hung in there, there's only one more morning drink to go -- and only one more day (or so) of the tinctures. You want to keep going until they are done. For most of you, the biggest joy is that you can start eating tomorrow. Just wait four to five hours after your morning drink. Start with a healthy raw salad filled with all kinds of organic goodies. Don't eat too much. It's probably worth doing a little heads up on how to "break" the fast – which you will be doing about three to four hours after your final "morning drink." When waking up a slumbering digestive system, the desire to eat may be intense. The flavors and textures of food can be enhanced by your super-clean nasal passages. Eating may seem like a brand new experience. Here are the guidelines so you can pick up what you need in order to prepare ahead. Eat small amounts of raw organic fruits and vegetables the first two days after the detox. Your body will continue to detoxify and cleanse during this period, and stay alkaline. Any toxins that have accumulated in your body will tend to be swept out by the action of the soft fibers of the fruits and vegetables. This will allow your digestive system a chance to gently wake up. Eat slowly and chew your food well. 1. First thing on rising, drink 8 oz. of pure water to flush your digestive tract. 2. Then, consume 4 droppers of Blood Support and 4 droppers of Liver Tincture. Note: A dropper equals 1ml, as marked on the dropper. 3. 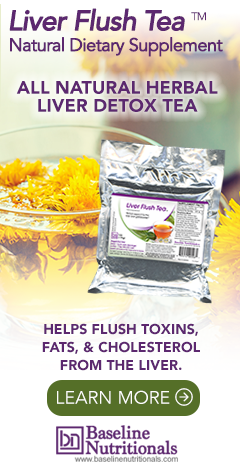 Turn on stove and simmer Liver Flush Tea for at least 20 minutes. Then turn heat to as low as it can go to keep the tea warm for you to scoop out as needed throughout the day. Fifteen minutes after consuming your Morning Flush Drink, follow with 2 cups of the Liver Flush Tea. Note: You may sweeten the tea with Honey or real Maple syrup. Be sure to strain out any small tea bits before adding to your cup to drink. Continue to keep the Liver Flush Tea on the stove at the lowest heat throughout the day. 1. Consume 4 droppers of Blood Support and 4 droppers of Liver Tincture. Note: A dropper equals 1ml, as marked on the dropper. 2. For lunch, you can have more diluted juice and potassium broth. Be sure to add two, 3 gram packets of the Sun Chlorella to your juice. Continue to drink lots of water, tea, and broth! Drink more diluted fruit and/or vegetable juice. Continue to drink lots of water and potassium broth. Take Colon Corrective and have more Liver Flush Tea. Drink more water and Liver Flush Tea. Drink Potassium Broth. As much as possible, do not add spices to the potassium broth. If you must, though, you can add a little "Bragg Liquid Aminos" or real Tamari sauce for flavor. At night, turn off the heat to the tea and just top the pot off with water and add 2 more tablespoons of Liver Flush Tea to the mix and repeat the simmering process in the morning.